MYCROFT: This is a chullo – the classic headgear of the Andes. It’s made of alpaca. SHERLOCK: Icelandic sheep wool. Similar, but very distinctive if you know what you’re looking for. I’ve written a blog on the varying tensile strengths of different natural fibres. MRS HUDSON (coming back into the room with a teapot): I’m sure there’s a crying need for that. Last night’s episode of the BBC Sherlock, “The Empty Hearse” was not only clever and well-written, it also contained several little “gifts” for the series’ devoted knitterly fans, including the little exchange quoted above as Sherlock and his (even smarter?) brother, Mycroft, play a game they call “Deductions.”* The goal of Deductions is to extrapolate as much information as possible about the origins of an object — in this case, a chullo left behind by one of Sherlock’s clients. The game begins as sibling rivalry and turns when Sherlock unexpectedly turns the tables by expressing concern that his brother’s intellect has made him lonely. However, before I talk about this hat the other knitterly-related moments in the episode, I must mention how much fun it was to follow Annie Modesitt’s hilarious live-tweeting of the episode. Annie Modesitt is not only a great knitter and designer, as we all know, but she’s quite a character. She is also launching a line of yarn based on Sherlock, 221B Colors, and each colorway is inspired by “the rich, saturated colors that the art director and lighting designer put together to further the plot and create mesmerizing atmospheric settings.” She’s going to introduce a new color for each episode in the upcoming season; I will be waiting with bated breath and knitting needles at the ready. Unrealistically, Molly wears this super-long scarf to several crime scenes, contaminating everything it touches. 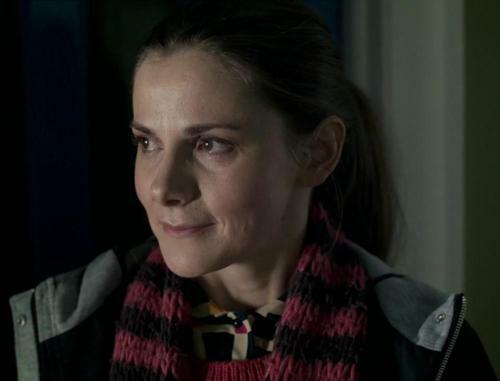 Unappreciated police pathologist (and fan favorite), Molly Hooper, gets her moment of recognition in this episode and even gets to spend a day sleuthing with Sherlock since Watson is still too angry at him for lying about being dead. Throughout that day, she wears a long pink-and-brown (or possibly purple) striped scarf (see the bad screen cap on the left). Rumor has it that the scarf was from the actress Louise Brealey’s own closet, so provenance will be hard to research. Nonetheless, I am sure that somewhere there’s an enterprising knitter working on a pattern right now. And here’s Annie Modesitt’s “Molly Hooper Cowl” (because the long scarf version just isn’t practical for a pathologist/partner in crime). Molly also wears a particularly unflattering, multicolored sweater you can see here. I’d like to think no one will try to replicate it (except for cosplay purposes), but I’m not that naive. The only mystery with this sweater is why it was sold at an actual store–for money–in the first place. Watson’s new fiance, Mary Morstan, wears a long, fluffy pink scarf for part of the episode, although I have yet to find a pattern for it online, although it was available for sale here (now, sadly, sold out). It’s pretty basic, but it’s a good color on her and it fits the character’s style which is much more traditionally feminine than Molly’s. * Thank you to Ariane DeVere for the transcription of the dialogue. Have a great day and I look forward to reading more of your posts in the future. First things first — thanks for checking in on my blog! Its reboot is still in the early stages so I appreciate every reader. Your pattern looks great, by the way! What yarn did you use? I still can’t decide what color the non-pink stripe is exactly — sometimes it looks black, but sometimes in looks dark brown or even purple. I’ll have to dig into my stash and see what I can come up with — I hope to see you around L.A. sometime.